Thank you for taking the time to contact us. I’m sorry to learn that this ad has caused you concern. We assess the content of ads against our Code. Amongst other things, we take action if we feel that an ad is likely to provoke serious or widespread offence, to mislead or to cause significant harm. We have reviewed this ad in light of your complaint but I’m afraid that we do not have grounds for further action under our Code. We have followed the links you provided in your complaint that relates to the Bio-Synergy Skinny Mousse. Following a review of this we could find no mention of naturally occurring Amino Acids. We contacted the advertiser who informed us that they themselves were not aware of this claim being made in relation to this product. Because of this we are unable to investigate further. If you do have a screenshot of the full claim or further information on where this was seen other than the links you provided, feel free to forward this on to me. I’m sorry if this was not the response you were expecting. Further information about the ASA and the work we do is available on our website, http://www.asa.org.uk. I thought I had sent you a screenshot of the offending ad but obviously I made a mistake. However, I saved a copy on my computer. 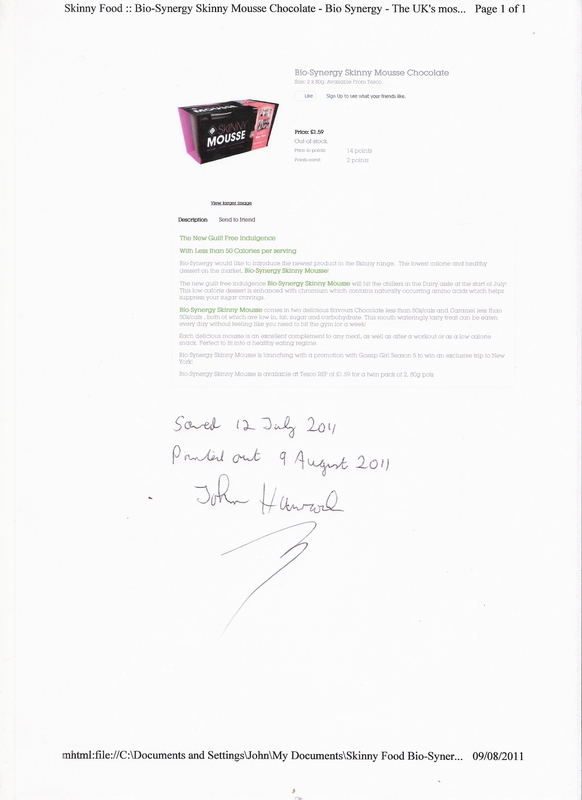 I have today printed out a copy, signed it and scanned the signed copy. I attach a copy of said scan. You will note that it does indeed contain the claim that the chromium supplements contain “naturally occurring amino acids”. I confirm that this is a genuine copy of the ad and would be happy to sign an afidavit to this effect. In any event I note that you have not addressed my point that there is no reliable evidence that chromium supplements have the claimed effect. We’ll see where this gets me. This entry was posted on August 9, 2011 at 6:15 pm and is filed under Bad Science, health, Quackery. You can follow any responses to this entry through the RSS 2.0 feed. You can leave a response, or trackback from your own site. Freezepage is very useful for grabbing pages and it automatically date and time stamps the captured page. See this page on the Nightingale Collaboration’s website for details. Thanks for that. I must remember to do that before making future complaints. At least I’ve got the saved version on my computer.